It probably won’t get that much attention because it was designed to play off the president’s supposed Fake News Media Awards scheduled for today — which turned out itself to be an example of Fake News propagated by the White House. But Jeff Flake’s Senate floor speech attacking the president’s hostility to a free press was impressively blunt, and might be considered fearless for a politician of Trump’s own party if it were not for the fact that the Arizonan is retiring at the end of this year. 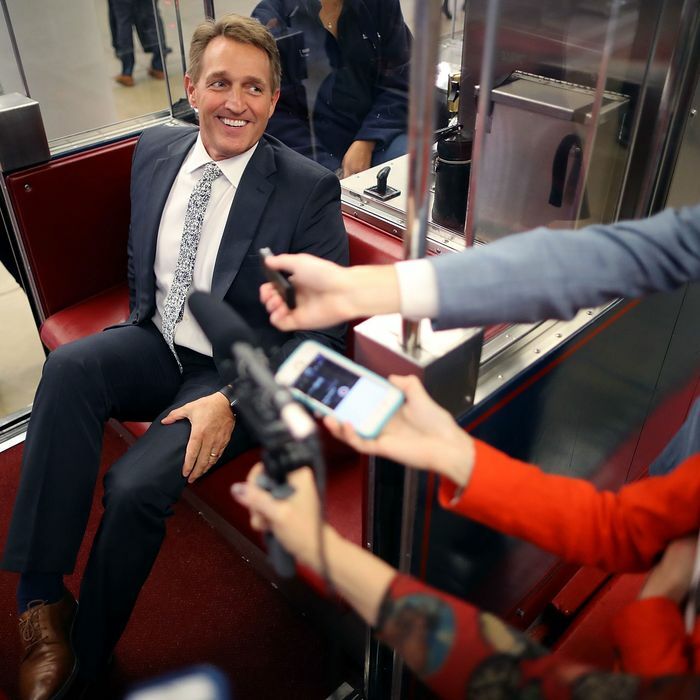 Flake’s most attention-grabbing passage compared Trump to Joseph Stalin for his application of the Soviet term “enemy of the people” for the news media. But perhaps his most important charge is that POTUS is becoming a role model and validator for tyrants around the world who would be perfectly happy closing down the Fourth Estate. He cited Syria’s Bashar al-Assad, the Philippines’ Rodrigo Duterte, Venezuela’s Nicolás Maduro, and officials in Myanmar and Singapore as adopting the “fake news” slur from Trump in order to justify their destruction of independent media. Not only has the past year seen an American president borrow despotic language to refer to the free press, but it seems he has in turn inspired dictators and authoritarians with his own language. This is reprehensible. Trump’s attempt to intimidate particular outlets and reporters — of which his Fake News Awards is only the latest and most cretinous example — hasn’t tamed them in the way he wants. Journalists such as CNN’s Jake Tapper or Jim Acosta have, if anything, become even more openly critical after Trump attacked them personally. Here again, the president took an old conservative tactic to an extreme, and it backfired. While conservatives found great success in charging reporters with liberal bias, which often led them to bend over backward to prove they were being objective, Trump’s personal attacks have only caused reporters to dig in on their professionalism and demonstrate that they won’t be cowed. That’s evidenced by the celebratory attitude so many journalists had towards the possibility of being fingered by Trump for some Fake News Media Award. If there were reporters and pundits cowering under their beds this morning out of fear that Trump would strike them down today with righteous lightning bolts followed by hordes of Trumpian trolls, they very much kept it to themselves. While bullying the media hasn’t worked very well for Trump, he’s had remarkable success cowing politicians of his own party, most of whom were not big fans of the mogul when he first ran for president, and many of whom could barely bring themselves not to denounce him even after he was their party’s presidential nominee. When more of them begin to echo, even faintly, Jeff Flake’s warning that Trump is giving aid, comfort, and even inspiration to the worst people on the planet, then maybe he’ll give his winning-by-intimidation act a bit of a rest.